Edward was Lord of the Manor of Shelland Hall and of Boxford co Suffolk. He was a successful manufacturer of cloth investing his profits in land. An Edward Alston was Amerced 3d on 23 Nov 1613, and the 10 May 1614 by Adam Winthrop Gent steward of the manor of Groton Court Barron. John Winthrop appears to be the Lord of this Manor. Ref Bury R O P534/5/38. His will recites the settlement he made on his wife Anne and refers to his having lived at one time at Polstead. THE WILL of EDWARD ALSTON of BOXFORD. Clother. I desire to be buried in Christian burial where it shall please my executors I bequeath to my loving wife Anne three messuages or tenements with the yards and gardens adjoining, a croft of land on the east side of sd tenements also a little tenement called Priors with garden and land adjoining with all the leades Cisterns glasse dores waynscott &c. situate in Stone street Boxford This bequest for my wife's joynture and dower according to a deed made between me and Richard Simnell gent. late of Colchester. Also to my wife L500 and the use of all my plate and household stuff during her life. On the death of my wife the same household stuff and plate to be equally divided amongst my three daughters Anne, Susan and Bridgett. To each of my daughters Anne Susan and Bridgett L500 to be paid on their attaining the age of 20 years. To Joseph Alston my sonne my manor called Shelland Hall with all the houses and lands thereon belonging in Ratlesden Shelland and Woolpett co. Suffolk also any lands in above towns, which I purchased of Sr John Deane Knt. also my messuages with the houses orchards and gardens in Sudbury Suff. Also my messuage and lands in Buers (Suff) late my father's William Alston. I give my son Joseph and his heirs male the above mentioned lands with remainder to Edward Alston my son and John Alston my son. I give to Edward son my messuage lands ten'ts and herd'ts in Nayland Missington Assington Clare Stoke next Clare and Chilton street (Suff). Also my messuage wherein I lately dwelt with the houses yards and gardens near White Street purchased from Adam Wynthropp gent Will Pond and Stephen Kembold also my messuage yards and grounds in Boxford purchased from John Sakter. I give to my son Edward the above land and to his heirs with remainder to my son Joseph and his heirs also in default of rightful issue, remainder to John Alston my son and his heirs. My executors shall hold the said messuages &c. devised to my sons Joseph and Edward until they reach the age of 13 years, the profits arising from said property to go to the discharge of the legacies. My executors also to receive the rents accruing from the manor and lands bequeathed to Joseph and Edward from the time of their reaching the age of 13 till they attain the age of 21 the money to be applied to the use of said sons respectively. My tenements in White Street Boxford I give to the use of the poor people of said town - i.e. the rent arising therefrom to be used to purchase yearly 30 ells of the best canvas to be given to 15 poor people the week before Christmas. To Edward Garrold my god son L5. I give to my eldest son John a full third part of all my freehold lands and tenements with the residue of all my estates, to be held by my executors until John is of age with ramainder to my sons Joseph and Edward amd my 3 daughters. My said wife Anne to have the government and education of all my children, my executors to pay her L20 a year for each child until they are of age - in case of my wife's death the executors to have the care of the children. Also L20 a year to my wife when the payments for the children cease, as an increase to her jointure. I give to my son Edward all my leasehold lands in Polsted. To John my lands in Bromford (Suff) with a proviso that the said John shall do all that is necessary to assure the lands devised to Edward and his heirs. I give John and his heirs my copyhold land and tenements in Groton with my house in Stone street Boxford holden of the manors of Groton Hall and Peyton Hall. If my daughters marry without the consent of their mother their legacies to lapse. To Mr Joseph Byrd parson of Boxford L5 to buy a piece of plate. To my godson Edward Andrew son of Francis Andrew of Hadley 20 marks. I appoint my son John residuary legatee with remainder to Joseph and Edward and to my daughters provided the said John does not fall into any riotous or disorded course of life and is governed by my said wife and my brother Peter Alston it shall be at the discretion of my brother to pay to my wife or any of my other children the sum of L1000 out of the moneys accruing to John if he leads a well ordered life. I appoint my son John and my brother Peter executors, to the latter L40 for his trouble, but he is not to be exempted from paying his debts to my estate. Proved 9th February 1617-18 - by Peter Alston the brother executor named in above Will with power reserved to John Alston the son and executor. Taken at Ipswich, 18 April 16 James i. (1618). Boxford ; of the residue of all his freehold lands so much as shall amount to one third of the whole, to his eldest son John ; the remainder to be held by his executors for performance of his will, till his son John, or next heir be 21, with contingent remainders to his other sons, and his three daughters Anne, Susan and Bridget, to each of which daughters he bequeathed L500. Executors :-his brother Peter Alston and, John Alston aforesaid. Edward died at Boxford, 22 January 15 James i. (1618), leaving John, his son and heir, aged 12 years and 23 weeks. The manor .of Shelland is held of . . . . . Rivett, widow, as of her manor of Rattlesden ; the messuage in Sudbury, of Robert Crane, Kt., as of his manor of Sudbury alias Woodhalls; the premises of Bures St. Mary, of Dame Jemima Waldegrave, widow, as of her manor of Smallbridge ; land in Clare, etc., of the King as of his manor of Enburye alias Stoke with Chilton ; land in Assington. &c., of John Gurdon, Esq., as of his manor of Assington ; land in Assington and Wissington, of the King as of his manor of E. Greenwich ; the site of the manor of Overtye, of John Acton, gent., as of his manor of Bramford. 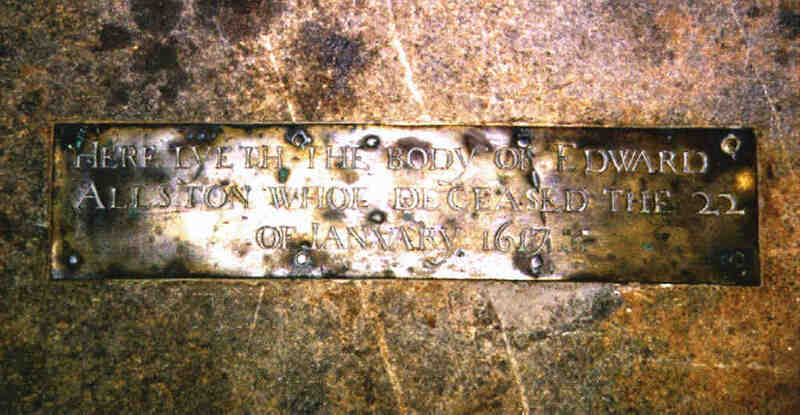 A small brass plate in the Sth East cnr of Boxford Church sanctuary reads " Here lyeth the body of Edward Allston whoe deceased the 22 January 1617", (9/2000). To my son Edward Allston and his heirs, all my properties in Bures (St. Maries), Suffolk, purchased of John Sympson and also those in Gt. Waldingfield, and Acton, Suffolk, purchased of Thomas Glovr. Alson L1276 13s 4d to be paid in three equal instalments at 4, 12 and 18 months after my decease. He is let off any debts to me. Edwards birth date is incorrect as his brother William was the eldest son and heir.